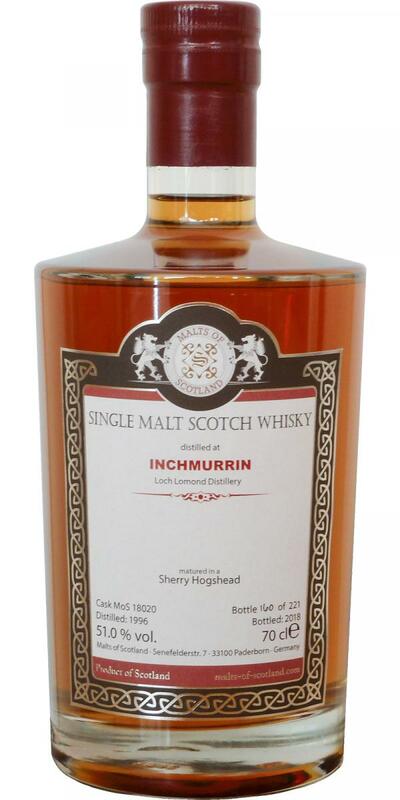 A lovely sherried Inchmurrin. Not the big chocolate sherry, but the matured/ complex one with room for spices, herbs and fruit. In this time, also a very good price €99,- for an almost 22yr old sherried whisky. Rose-hip and mandarin. Forest fruit like blueberry and other berries. Dried leaves and moss gives it an walk in the autumn forest feeling. Also pine trees and wet earth or meadow. Tobacco boxes and antik furniture with polish. A nice nosing whisky indeed with delicate flavours. A full bodied and juicy palate with apricot and apples next to plums and oranges. Lot's of jams. So fruity indeed, but more rounded and sweet. Vanilla and honey with some pepper. Only in the back some creamy milk chocolate with some almond. A soft and warming whisky. With woodspice, some nutmeg and liquorice. Dried fruit like raisins and some cold orange tea. Great spirit, great maturation. It's friendly and welcoming, and very complex. It gives you mostly an earthy profile. The fruit is there too, but to a lesser extent. The leafy side of sherry maturation: autumn leaves, tobacco, dunnage warehouse and red fruits. Then: milk chocolate, coffee, toffee and cinnamon. Very fresh compared with the nose. There is quite some orange juice, and maybe even some vanilla. Is there a trace of smoke too? Further it's still leafy, earthy on tobacco, forest soil, putty. Along comes a whiff of mint and ground coffe. Long and pleasant with orange marmelade, tobacco, dunnage, plum jam, coffee, milk chocolate and allspice. I quite like this, a nice and complex dram that’s not overly rounded. It piques my interest in this somewhat low profile distillery. First sniff is like slightly rotten fruit in the mud. Earthy notes, cherries, raisins, chocolate, mild pepper, a slight solventy note. Marzipan with some time. Sweet fruit at first, pomegranate, grapefruit, blood oranges. Then a slight smokey note too. A bitter note too, although I can’t pinpoint it, white pepper. The finish is quite long and enjoyable. Red fruit lingers with slight smoke and burnt toffee. Nice whisky with vibrant and pleasant nose, which has obvious sherry influence in terms of dried fruitiness. Gently smoky with beautiful and unusual character. The balance is quite good but not totally superb. A bit sharp on its full strength but becomes much softer with water. I really enjoyed it and the price of 100€ doesn’t look too high for a whisky of this quality and age. "Smoky sweet Kellerfund with Heinz Erhardt"
"Smoky-sweet Kellerfund with Heinz Erhardt"
Color: light amber. Nose: first rather earthy, quickly supplemented with aromas of dried apricot, prunes, liquorice, black pepper, vanilla, marshmallows and honey. Taste: the earthiness of the nose is clearly present, now with notes of currants and raisins, dried plums, figs, cinnamon, clove and black pepper. The aftertaste is wonderfully soft and refined sweet.